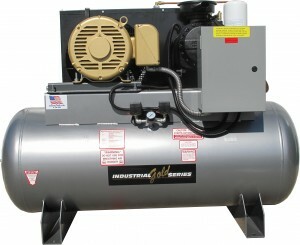 Which air compressor is right for you? For most shops, having an air compressor is a necessity. If you’re in the market for a compressor, make sure the air compressor you choose is the right one for your business and that it will meet all the requirements you need. With dozens of manufacturers to choose from, Tools USA only sells the most reputable and well-known brands. We stand by their products and they all have a 1-year parts warranty. Whether you are going to use it occasionally or on a daily basis, there are several factors to consider. Tank size, configuration, horsepower and required CFM’s are important to think about. Should you choose a vertical or horizontal unit? The configuration of the air compressor is important. Air compressor tanks vary widely in size, so it’s important to think about how you will be using it to determine the size you’ll need. Tools that work in short bursts—an impact wrench, for example—work well with a small tank. Tools that continuously use air such as grinders, spray guns and sand blasters will require a larger tank. If you can’t decide, be safe and go with the one with the larger tank. As tank size increases, so does the overall size of the compressor. If you want a big tank but have space concerns, consider a vertical tank instead of a horizontal model. To conserve space, a vertical compressor can be a big bonus when compared to a horizontal unit. How much power do you need? The CFM and PSI ratings indicate which tools a compressor can operate. Make sure the compressor can supply the amount of air and pressure for your tools. Select a compressor that exceeds the CFM requirement of your most powerful air tool. For example, air hammers, die grinders, drills and ratchets require 4.0 CFM and around 90 PSI. High-speed grinders require 8.0 CFM while sanders are around 6- 7.5 CFM. Air compressor motors range from simple 110-volt, 1/2-horsepower jobs all the way up to three-phase, 220-240-volt with 25+ horsepower. The electrical service available to your shop dictates the largest compressor you can install. The electricity used in industrial settings is generally three-phase power. Click here to learn more about how to choose the right size compressor from Industrial Gold. Quarterly: Change oil and filter, check condition and alignment of belt, flywheel and motor pulley, check operation of the safety valve, check pressure switch unloader to ensure the compressor unloads when the motor shuts down and clean dirt and dust from the pump fins and motor. Every 2,000 Hours: Lubricate electric motor, Inspect and replace (as necessary) the pump valves, check valves, safety valves, pressure gauge, and belt(s). Why is Industrial Gold one of the manufacturers we choose to offer our clients? We like that they are family-owned and operated since 1996 and they build all of their products with same level of pride and commitment that they started their business with. They make the simplest to operate, easiest to maintain and most reliable compressors on the market today. Simply put, they make a quality compressor at a great price and Tools USA is happy to offer the full line to our customers. Previous Previous post: What Does Your Parking Lot Look Like?